Controversial Construction: Should We Preserve Urban Renewal Projects? Adrian Scott Fine, Director of Advocacy at the Los Angeles Conservancy and a research fellow for the James Marston Fitch Charitable Foundation, is aiming to tackle an ongoing struggle in the preservation community: What do we do with urban renewal projects that are themselves becoming outdated? Over the last year, Fine has traveled across the country visiting places such as Philadelphia, New York City, Washington D.C., and various cities in Connecticut to speak with communities about their histories of urban renewal and the role of preservationists to protect these often-controversial sites. As a preservationist-in-residence at the Marcel Breuer house at Pocantico (a residency facilitated by the Rockefeller Brothers Fund and the National Trust), Fine had the opportunity to focus on his research at the Modernist home originally created as an exhibition piece for the Museum of Modern Art. Fine sat down with us to discuss his research, his time spent as at the Marcel Breuer house in Mount Pleasant, New York, and the ways preservationists can engage with this complex issue. Click here to read the original article and to view images. What inspired you to begin your research of the preservation of urban renewal projects? I’ve always been interested in modernism and the challenges we deal with trying to save these places from the 1950s, ’60s, ’70s and so forth. Recently, we’ve been dealing with issues, specifically development in Los Angeles, that came about through urban renewal and how to talk about them, how to build support for them, how to acknowledge the stigma and baggage that are often associated with these kinds of places. It’s an added aspect that you have to deal with when you’re trying to make a case and ultimately convince people that these places should be reused and saved rather than demolished. That really got me thinking more broadly [about] how this is playing out on a national perspective, and that no one is really looking at this issue at the nexus of urban renewal, the early origins of historic preservation, and modernism, and [how] all those three things came together at one point in time and now looking back 50, 60 years later. How well are we doing in terms of those three things and this history of the undoing of urban renewal? 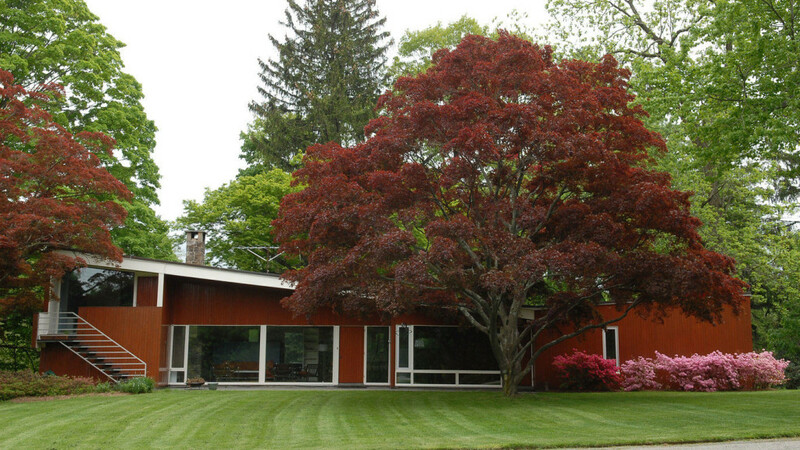 As part of your research you were invited to participate in a residency program at the Marcel Breuer house. What was that experience like? I’ve been working on this project for the past year, but when you’re working full time and you have a life, there’s not often enough time when you can check out and just really focus in on a project without interruptions of daily life and work. To have an opportunity to do that for almost two weeks, to be at this house and really focus in on my project, was a phenomenal experience. What was great about being there was I was in close proximity to some of the places I really needed to see and understand better. I was able to go to New Haven, Hartford, Manhattan, so that was an incredible opportunity to really understand them and have the time to go see [those places]. The house itself was very inspirational because it’s a Modernist building and I’m talking about the Modernist era. The architect of the building, [Marcel Breuer], had been involved in [urban renewal] projects across the country during that time. The Rockefeller family was involved in urban renewal projects themselves like Lincoln Center in New York City, so there were a lot of interesting intersections in terms of my project and the place in which I was staying to think about. What is the most recent project you are working on for your research? One of the projects we are working on [in Los Angeles] is an effort to save Parker Center. Parker Center is LA’s first central police station that came about in 1955. This was the first centralized, modern-era police facility, a headquarters where you had all the operations under one roof. This was an early example of police operations, but it came about in a very early version of urban renewal in that it took away two to three blocks of the Little Tokyo community which is adjacent to the building. And you know that was not handled in the best way in terms of how the community was essentially pushed out and this building was built very much with its back toward the community. Now the building is empty and there’s an issue about what to do with it. And there have been proposals to demolish it, proposals to reuse it, but mostly it’s looking at demolition. In that particular case, this issue of it coming about through urban renewal was particularly relevant in terms of talking to the Little Tokyo community that exists today and how they feel about this building. What’s interesting about that is they see the value in preserving Parker Center in part to tell the story about what happened to them and their community during urban renewal and, if this building is lost, it’s harder to tell that story. I think that’s particularly relevant in terms of how other communities are dealing with this. It may have been 50, 60 years ago, but many of the people who were impacted by urban renewal still remember it, still harbor ill feelings about that, and sometimes that’s attached to the building that came about through urban renewal. Reach out and go to those communities and say, acknowledge, “We understand what happened to your community in this timeframe,” and have a conversation and build a relationship and trust. One of the things that we did in LA is we did a panel where we brought together not traditional preservationists and architects, but we brought together people from the police administration, people from the Little Tokyo community, and other folks to really talk about what does this building, this place, mean to you. And to have a conversation often doesn’t happen was great. I think we made some inroads there in terms of other communities understanding more what we are about and vice versa, but also understanding there’s probably more commonality there than not when we’re talking about preserving and having communities that are healthy and connected. I think we found some real commonality there. History is history. There’s bad history, there’s good history, but it’s history at the end of the day. And sometimes it’s the more difficult, challenging, controversial, and sad stories that are the most meaningful and the places that help tell these stories. These narratives are really important and significant. If we lose these places that maybe have some baggage or some stigma, we lose the opportunity to tell the full story and sometimes it’s the most meaningful story and it’s a way to connect to communities that, traditionally, preservationists have not always been able to build strong relationships with—African American communities, Latino communities, marginalized communities. That’s very much about what was happening during this era; these were the communities that were traditionally seen as the path of least resistance, and these were the communities that were pushed out. And now as the preservation community has matured, we are looking at saving these places from this era’s controversial period of community planning, [and] it’s an opportunity to connect with those communities in a new and very meaningful way. Fine’s research will culminate in a white paper including his findings and proposed best practices for these buildings and how to best protect them. He hopes to make a PDF available online following its publication. Read the original blog post from the National Trust for Historic Preservation.